In our previous guide, we learned about the fundamentals of iBeacon and BLE technology. The iBeacon field is becoming more crowded everyday as small start-ups and bigger, more established companies recognize the potential of iBeacon and BLE technology. Today we’ll take a look at some of the companies making headlines with their iBeacon-related solutions. Estimote is currently selling iBeacon developer kits for $99. These kits, built for tinkerers, early adopters, and publishers, allow developers to integrate iBeacon functionality into their existing Apps. The development kits come with three hardware beacons. Estimote as it stands now is primarily a hardware company, although they do have an iOS and Android SDK in the works. inMarket made a big splash this year with the very first multi-retailer implementation of iBeacon. inMarket’s Mobile-to-Mortar iBeacon Platform allows publishers, retailers, and brands to connect with consumers in-store using iBeacon technology. inMarket’s platform includes an SDK, beacon network, and proprietary ad serving technology. On the hardware side, inMarket’s beacon network includes proprietary securitization and encryption technology, and is currently implemented in over 250 grocery store locations. inMarket has worked with over 100 brands and its current platform boasts 20 million shoppers. Gimbal, by Qualcomm Retail Solutions, is a context-aware platform that brings geofencing and iBeacon functionality to Apps. Its platform includes an SDK for developers and a dedicated back-end for managing beacon networks and content delivery. Gimbal also makes its own dedicated hardware to round out the solution. Kontakt is a white-label iBeacon solution. They make their own beacon hardware, which come with a back-end system for beacon set-up and content management. Swirl is a marketing platform with a retail focus. Their offering includes a content management system, an SDK for developers, and dedicated hardware beacons. Most recently, fashion retailer Alex and Ani implemented Swirl beacon hardware in its stores. Sonic Notify bills itself as an “Enterprise Proximity Solution”. Its beacons combine audio signals, iBeacon, and Android BLE technology for cross-platform compatibility. The beacons come with a back-end content management system and an SDK for integration into existing apps. Most recently, they implemented the technology in NBA arenas where it was used to upsell tickets to better seats. Indoo.rs is an indoor positioning and navigation company. Their mobile SDK allows developers to integrate iBeacon functionality into apps. Indoo.rs is focusing on applications beyond retail – in places like airports, shopping malls, hospitals, museums, and enterprises. Main features include indoor navigation, routing, asset tracking, and analytics. They’ve partnered with Kontakt.io for help on the hardware side. They charge a fee per Monthly Active User per App per month. Mobiquity Networks has just come out of stealth with an iBeacon-enabled network that covers 100 U.S. malls. Mobiquity’s offering includes an SDK and managed advertising network. The beacons are not in stores themselves, but rather in corridors and common areas within major malls. It seems to me that beacon hardware will become a commodity in the near future. You can already get these things almost dirt cheap. Are there any features on current Beacon hardware out in the wild that set any company apart? It seems like the real money in ibeacons down the road will go to those who build platforms and open the broader door for different kinds of services and apps to utilize an infrastructure of beacons. Fully agree, ultimately the hardware is getting commoditized and the service, features, UI etc would be the main differentiator. We agree 100% with your comment and have built a robust Beacon Management System. Check out http://www.westcompass.com for our complete Place suite (PlaceBMS, PlaceAPP, PlaceBeacons)that offers a ready to go platform that supports all beacons types. We also have an iOS and Android app that supports over 20 languages. This is Vivan from Sensoro company (www.sensoro.com). We might called you before. Much appreciated! Our company is focusing on the iBeacon hardware. And I hear your company is working on iBeacon solution. We hope we could setup close partnership with your company and provide support for your business. We attended the TC Disrupt in SFO last week. It was a successful one. If you are interested in that, we could provide you a few samples. Please let us know you if you need that. Our company is focusing iBeacon hardware and firmware. Our ibeacon is based on Nodic chip. Its hardware spec is attached. Beside basic iBeacon’s function, there are 3 more sensors (temperature, lightness and accelerometer) are embedded in the device. Our firmware has a unique function which could broadcast battery status and other sensors information with the UUID/major/minor id. This is our patent. It is not like other company’s design which has 2 distinguish models (ibeacon and sensors). For the 2 modes, iBeacon ids can’t broadcast with sensors data. With this feature, Smart Phone APP could get our “Yunzi” ibeacon’s UMM and sensors information at the background. With that, we can implement central beacons’ battery management. Our goal is to build best iBeacon hardware and firmware, and our new beacon “sticker”‘s flexible circus board which will be in Market in next Monday. Nomi is missing from this list. Let me know if you’d like an overview so you can include. Thanks for the feedback Wesley. Would you mind sending over an overview? Complies fully with Apple’s iBeacon specification. Our backend, MOCA Platform is missing from this list. If you would like an overview in order to include it, just let me know! Does anyone know how to site survey for deployment? is it similar to 802.11? How do we know where to place them within a store? I’m imrdsesep. You’ve really raised the bar with that. hello there and thanks on your info ? I’ve diilfnteey picked up something new from proper here. I did on the other hand experience some technical issues the usage of this website, as I experienced to reload the web site lots of occasions prior to I may just get it to load correctly. I have been pondering in case your web host is OK? Now not that I am complaining, however slow loading circumstances occasions will sometimes affect your placement in google and can injury your quality rating if advertising and marketing with Adwords. Well I’m adding this RSS to my email and could look out for much extra of your respective fascinating content. Ensure that you replace this again very soon.. Thanks for the post. I have constantly obervesd that the majority of people are eager to lose weight simply because wish to show up slim along with attractive. Having said that, they do not always realize that there are many benefits to losing weight also. Doctors state that obese people suffer from a variety of disorders that can be directly attributed to their excess weight. The good thing is that people who sadly are overweight and suffering from diverse diseases can reduce the severity of the illnesses by means of losing weight. You are able to see a slow but notable improvement in health if even a moderate amount of weight-loss is realized. Simply to follow up on the up-date of this topic on your site and would wish to let you know just how much I vaelud the time you took to put together this valuable post. Within the post, you actually spoke regarding how to actually handle this thing with all comfort. It would be my own pleasure to gather some more thoughts from your web page and come up to offer other people what I have learned from you. Thank you for your usual wonderful effort. Smart beacons from BFonics (proximity marketing platform targeting retail and hospitality domains) are missing from the list as well. Our Hardware, android and iphone SDK is available and shipping worldwide. Our beacons comply with Apple’s ibeacon specification. We are FCC certified, and CE marked as well. Our Beacon Hardware Guide helps filter and search for Beacons based on their price, battery life, range, and compatibility with various mobile operating systems. You can also learn about the most common use cases for leading beacons in the market. Kindly share me complete details of beacon hardware, cost, range, etc. Also are they available in India, please advice. I am looking for a beacon. Can you please help me out with that? We think that beacons are only one piece of a big cake and to harness the full potential of Beacons and the IoT, we are combining different technologies, such as big data analytics , ibeacon and geolocation in our MOCA platform. 1. To detect visitors, it requires users to pre-install an App on their smartphones. 2. iBeacons just operate in iPhone 4S ahead with iOS7-8 installed, and consequently, It covers les than 15% of the market. 3. Not only installed applications are require, but also you must have the Bluethooth on, but in practice, almost no one keeps it switched on continuously. 4. Its range is just 25 meters and it’s not configurable. 1. Seeketing Nodes detect all devices equipped with Bluetooth or Wifi (100% of the Market) or even Cellular Network (2G/3G/4G). 2. The scope can be set to 300 meters; in any case it’s configurable. Although at first, there appears to be no differences between iBeacon technology and Seeketing Nodes, there is a huge barrier to use iBeacon in the store that Seeketing Nodes have successfully overcome. Version 2 will be ready this week. Cheers, Sean (CEO @ LocalSocial). I think I can see what you guys are trying to do and it is a very good tech and idea. If I am not mistaken; A wireless signal pops up, as set up by you, on a phone or PC and people connect or try to connect and immediately they can only see your products details, pictures and information online via some sort of Blog posts or website? I would like to know the following. 1. How much does it cost to deploy? 2. Can it be remotely set up from where you are to another location? 4 Lastly, can my company (Divine Networks) represent you (i.e. get clients for you) from anywhere in the world and get commission for it? Thanks and looking forward to answers to all these 4 questions. Can you please make an update to the content of this page? Considering the pace, this information is most likely very outdated. In-line with what Elizabeth said about iBeacon being only one piece of the whole picture, my company combine iBeacon with NFC and even QR to make any object smart and connected. Also at Linktagger we are doing more outside of the usual retail area that others in the industry seem focus on. We are working on several projects within Health & Fitness, ecommerce, smart cities and even have pilots in the medical field for iBeacon and NFC. Whilst the hardware is important, we believe that it will be the software wrap around that will make or break iBeacon. Also with the advent of the new Uri Beacon standard I think we might see multiple levels of mobile engagement, Uri Beacon will surely be the best implementation for non app based interaction, while iBeacon will offer a more immersive and automated experience. Check out our website at http://www.linktagger.com, would be great to get added to the list for review. We are currently in BETA with 7 partners with a national roll out later this summer. Our iBeacon solution, called Advos, is an enterprise proximity platform. The founding team met while working on the Cartwheel By Target App. We manufacture two types of beacon products “smart zone” “smart tag” for both passive/active interaction. We also have SDKs for IOS/Android to integrate with your app. Would love to have our marketing / analytics solution be reviewed for this list. Hi, I would like to know if it possible to vincule the ibeacon to whatsapp or facebook. Then, when people get into our place they recive a whatsapp message of our promo or facebook message for follow or page. Apple is vague about what it specifically means by an iBeacon. We take the definition to include the software protocols inside a user s app, the use cases and user experiences, and the specifications that Apple requires of any beacon that can be called an iBeacon. Jaalee is a start-up company but with full expeearience in iBeacon technology. We’ve start the iBeacon technology development and manufacturing since 2012. We provide firmwrae and housing customization, and we also provide the re-brand service.Recently, we have several types of iBeacon including USB and normal battery type. Hi, my name is Isaac. I think iBeacon can be a potential investment for me. I have a project (initial stage) which might require this devices. do drop me a mail tsz0110@live.co.uk if you are interested to show me more. Thank you. We are going to start providing a service of developing phone apps with ibeacon tech for businesses. We want to develop the app and our dashboard for our clients to use as SAAS. 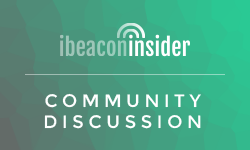 Do we integrate with existing Ibeacon platform companies? Do they let you use their kit for your own product that you are going to be selling? Do we design our own beacon management platform and dashboard? It would be lovely if on a software site there was a filter for “Spam” posts. Does not fill me with confidence regarding anything posted when every other comment is regarding weight loss or Terry Tibbs trying to get me to invest my money in their start up programme in the Bahamas. Im looking for a iBeacon solution for a project im working on. I need an app which can be customised after my needs. – W20mmxL20mm and the height is maksimum 15mm. – Its not needed to be able to change the battery. The product it must be inserted in will be worn out after 2-3 months. – If its possible to activate the iBeacon from the app then it would be very nice. Somebody is still trying to use ibecons instead of seeketing nodes for retail enviroment? I suppose not. In last RTBE in nobody want to hear nothing about ibecons. What kind of proyects are you dealing with?